Mobile phone firms have reached a deadline to cut the price customers are charged for sending text messages in member countries of the European Union. The price of using data on phones while abroad - including internet access - must also be slashed, the EU has said. Failure by the companies to reach an agreement may see legislation brought in that would force them to change the way they charge customers, the EU says. Details of whether or not a deal has been reached are due later. EU Telecoms Commissioner Viviane Reding is not expecting the firms to have agreed to sufficiently lower their roaming charges. Last week, the European Commission unveiled plans to lower the cost of mobile phone calls by reducing the fees operators charge each other for using their networks. Europe's telecoms watchdog published guidelines for laws to harmonise call termination fees across the EU by 2011. Currently, 27 national authorities regulate fees charged by an operator for handling calls from another. Brussels said consumers ended up losing out because of variations in cross-border fees. 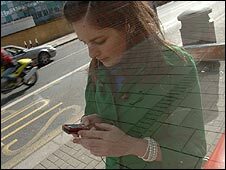 Operators have until 2011 to abide by the new regulations, which the commission estimated would make calls 70% cheaper.